[Image: The Jim Creek Naval Radio Station from Popular Mechanics]. For a variety of reasons, I’ve been looking at a variety of large terrestrial antenna sites built for communicating with submarines. This is the field of Very Low Frequency (VLF) and Extremely Low Frequency radio transmission (the latter wonderfully abbreviated as ELF). This is a topic already explored here several years ago, of course, with the Project Sanguine antenna field in Wisconsin, for example, and the Cutler array up on a peninsula in Maine. But a few other examples came up that I thought I’d post. One is the example you see above: the Jim Creek Naval Radio Station in the woods of Washington State, as featured here in an old issue of Popular Mechanics. The Jim Creek facility is basically an entire valley in the Pacific Northwest, denuded of its trees and then strung with the harp-like cables of a mega-antenna. This antenna then broadcasts “the voice that crosses the Pacific,” as Popular Mechanics describes it, including U.S. military ships and submarines. [Image: The antenna field at Jim Creek, via Wikipedia]. Briefly, although it’s technically irrelevant, it is nonetheless interesting in this context to read about the so-called “Hessdalen lights,” a phenomenon that appears to be caused by natural electrical currents moving through a remote Norwegian valley. The scientific explanation for these “lights” is incredible. By a weird fluke of geochemistry, the entire valley is a natural electrical cell! Now imagine a valley somewhere—in Washington State, say—acting as a giant natural radio transmitter: a geological radio station broadcasting signals out to sea. In any case, here is the Jim Creek facility on Google Maps. Two other quick things to mention: as a commenter pointed out here a few years ago, there is a spectacular naval-communications facility located on a peninsula in Western Australia called the Harold E. Holt Naval Communication Station. [Image: Harold E. Holt Naval Communication Station, via Google Maps]. According to this commenter, the station “has an eerie suggestion of sacred geometry[:] pentagons and symmetrical shapes, all concentric. It is said that under the array, light bulbs held in the hand will glow.” This is not impossible; recall the work of artist Richard Box. Indeed, seen on Google Maps, the facility is breathtaking. Be sure to zoom out to get a sense of how isolated this place is. 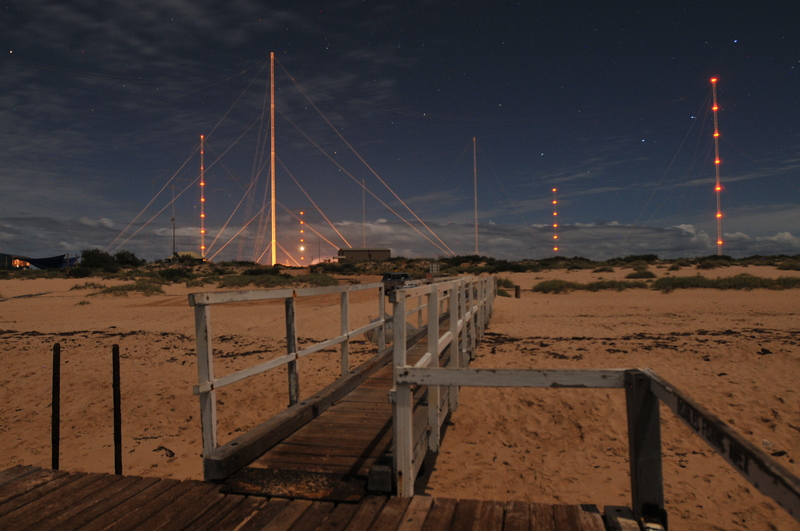 Here is a view of the antennas from the nearby beach. Finally, there is something called ZEVS. ZEVS is a secretive, Soviet-era electromagnetic facility and submarine-communication antenna array that allegedly exists somewhere beneath the forests of the Kola Peninsula. There’s not a ton of information about it online, but I’m also just lazily Googling things at the moment and have undoubtedly missed something; if you have more details, by all means please feel free to share.